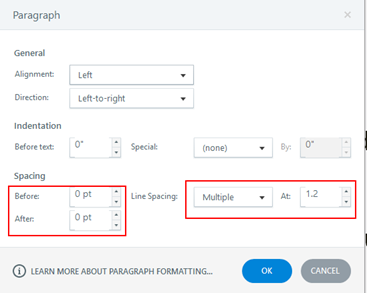 Hitting the sweet spot when it comes to line and paragraph spacing in Storyline can be annoyingly troublesome if you are not aware of the subtle options available to you. When accessed, the Line Spacing drop-down menu includes line spacing presets in 0.5 increments from 1.0 to 3.0. These values represent the ratio of the line spacing to the size of the type. Often times and because of the font selection, available space, or other reasons, the presets just don't cut it. It pays to take the extra little step and choose Line Spacing Options. 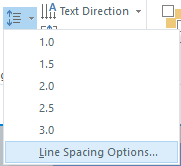 From the Line Spacing drop-down menu in the Paragraphdialog box, selecting Multiple gives you the option to enter your specific line spacing ratio instead of just using a preset. Another area of interest in the same dialog box is the Spacing Before and After values. These represent the automatic default spacing above or below paragraphs. These also can be precisely tweaked to make your content fit much more beautifully.